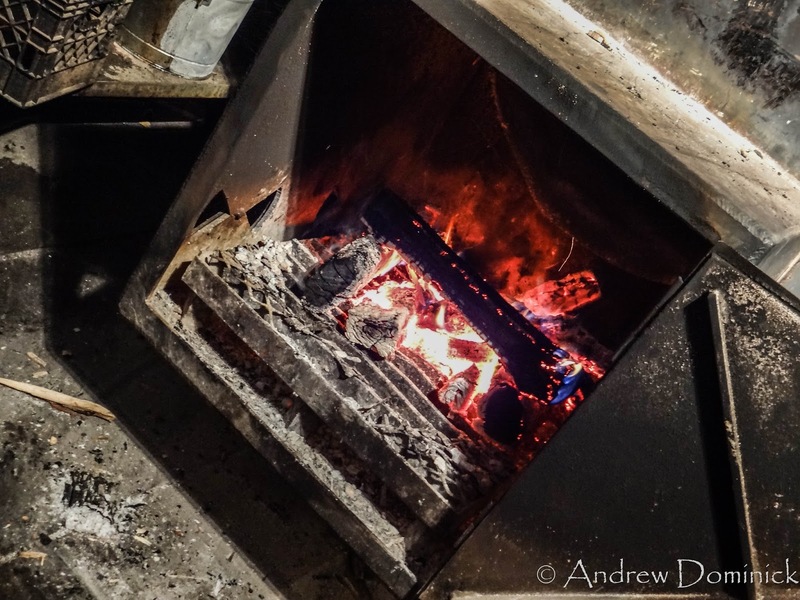 Talkin’ That HooDoo ‘Que – Reviews + grub knowledge from CT, NY, and beyond. I’m pretty sure it’s the best BBQ in Connecticut and beyond. HooDoo gets crowded and you’ll notice that when you pull into the parking lot. There are some spaces right in front but Hoodoo shares the area with a few businesses that obviously don’t want HooDoo taking up the whole thing. It helps that there are extra spaces in back. If the parking lot is crowded, that means the restaurant is too. I’ve heard of wait times during peak times and on peak days being in excess of an hour, but on a busy Thursday night I got a table in about five minutes. I should’ve bought a shirt. On the inside, HooDoo would not be mistaken for a French restaurant. 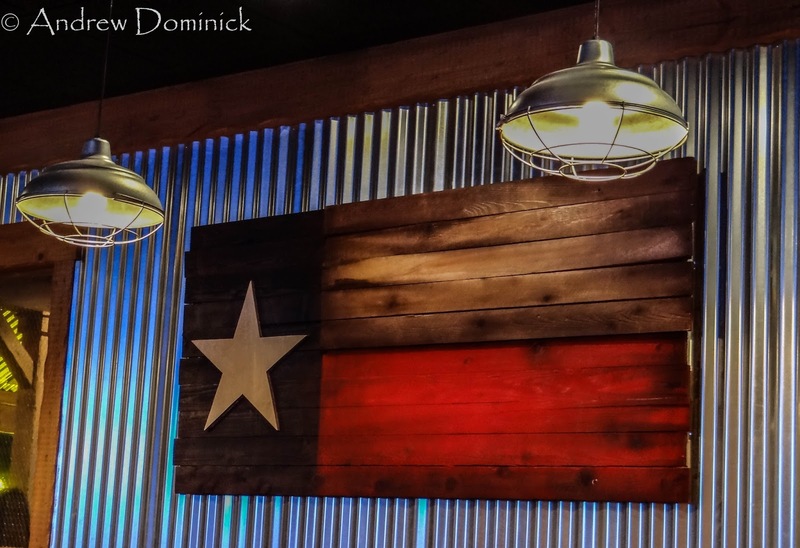 Lots of wood, some shutter style metal, a handmade wooden Texas flag, outlaw photos on the walls, and in the BBQ a fitting illuminated sign that reads “BBQ.” The highlight of the dining room is the see-through window that reveals a massive custom made smoker that can hold lots of meat. 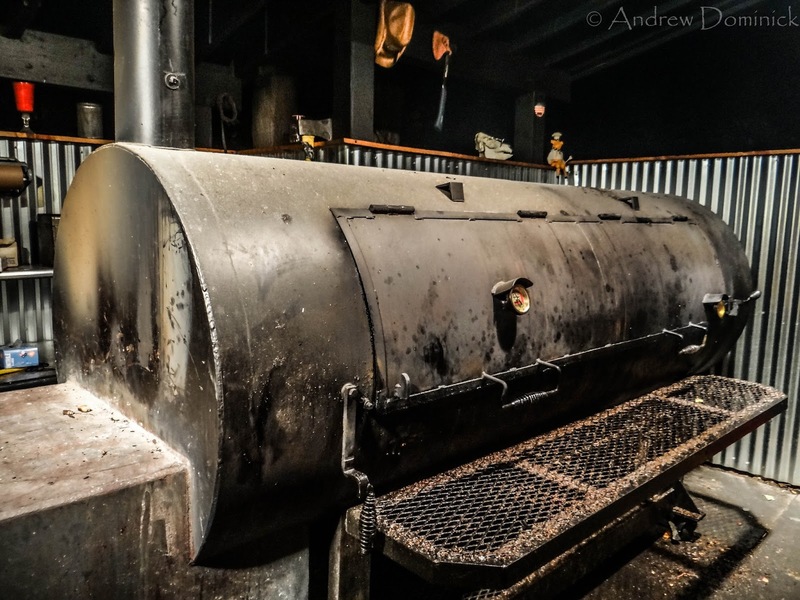 I went back there to get a look at the smoker, and its beauty made me all watery-eyed but mostly because the smoke got in my eyes. 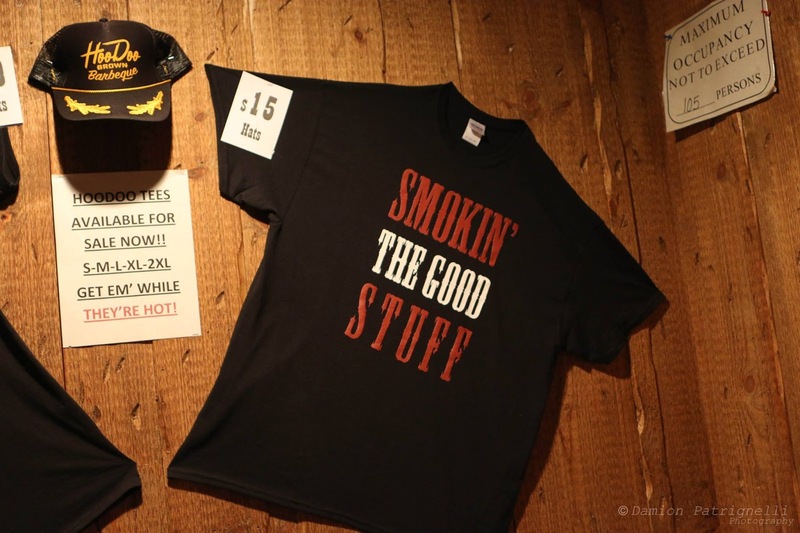 The smoker room definitely is a focal point of the restaurant. The mood of the dining room is happy. I mean, hell, it’s a BBQ place! It had better be happy! HooDoo is as casual as casual gets, and it’s perfect for groups. 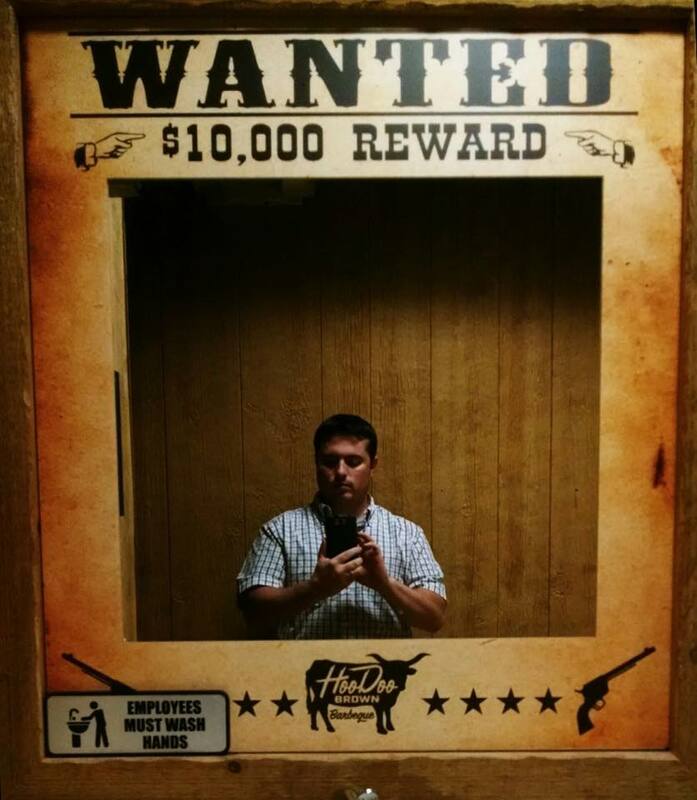 Hoodoo Brown…Who’s that guy?! His real name was Hyman G. Neill and he was the justice of the peace, coroner and mayor of East Las Vegas in the late 1800s. Because Las Vegas, New Mexico was a shady type of place, he formed the infamous Dodge City Gang made up of gunfighters. The gang (actually police officers) became just as bad as the baddies they were chasing. Some of the crimes they engaged in? Corruption, theft, robbery and murder. I’m sure that laundry list is longer. Cody (right) & Chris (left) chillin by the smoker. Yeah, we suggested the holding of the ax! Sperry (a Ridgefielder), got the idea to give this BBQ thing a shot when he came back from a guy’s trip to Austin, TX. 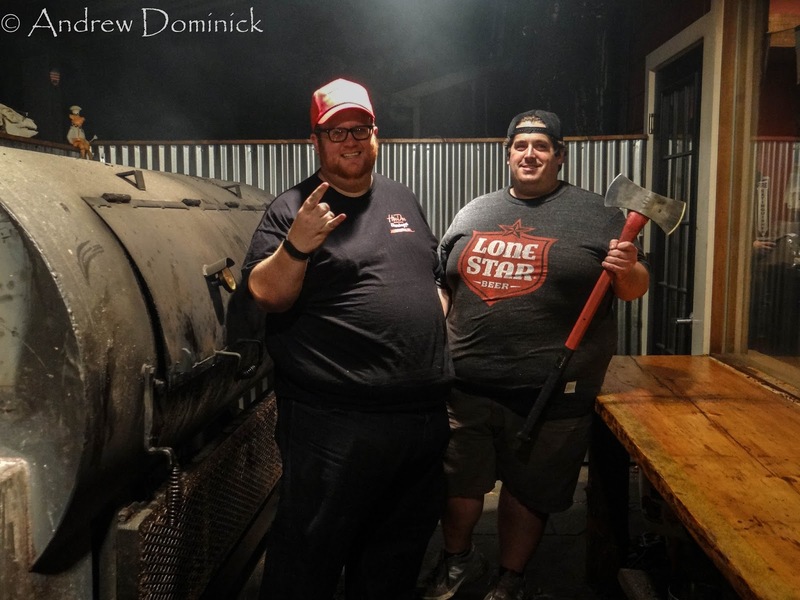 A van, a bunch of the fellas, and around a dozen of Austin’s best BBQ joints gave Cody the idea that he could do this thing. It helped that many of the places he visited were welcoming and shared some inside info on Texas BBQ. Cody tested out the knowledge he picked up on the trip at home, opened a catering business first, and then decided to open HooDoo. 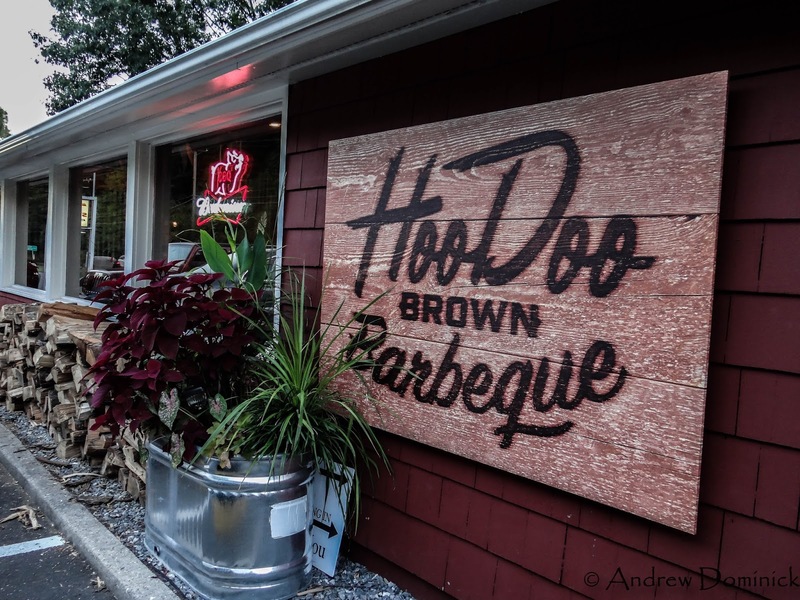 He met renowned East Coast pitmaster Nestor Laracuente online and that team-up results in the amazing low & slow BBQ that HooDoo delivers every time out. Meats are smoked for upwards of 16 hours at temperatures between 225 – 250 degrees. Very rarely are the smokers not smoking meats and there is always someone tending to the equipment and actively paying attention, even overnight since they load up the smokers at 10:30 each night. HooDoo uses wood local to CT. Oak and maple provide smoke but aren’t assertive as a mesquite or Applewood. They want you to TASTE THE FLAVOR OF THE MEAT. I’ll start by saying that I couldn’t possibly try everything in one visit but I plan on getting around to it. I did make a decent dent in the BBQ portion of the menu though. My favorites were the brisket and Cracklin’ Pork Belly. 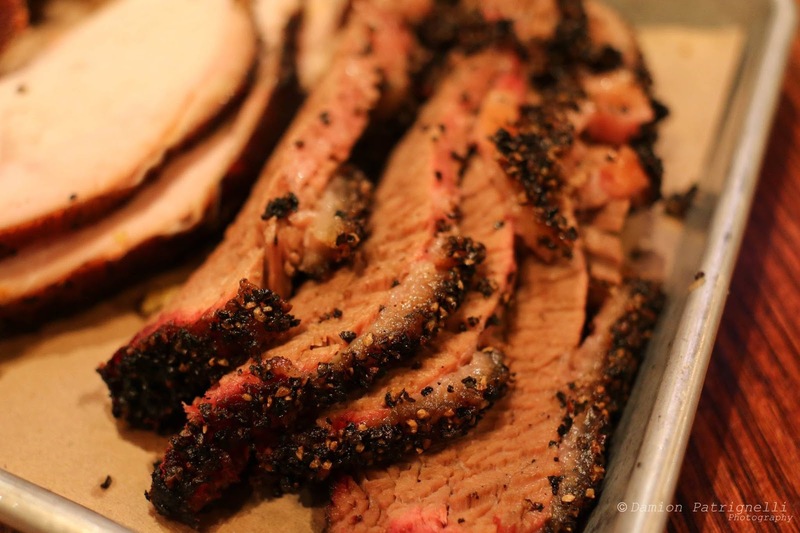 The brisket is seasoned simply but expertly with a blend of salt & course ground pepper. 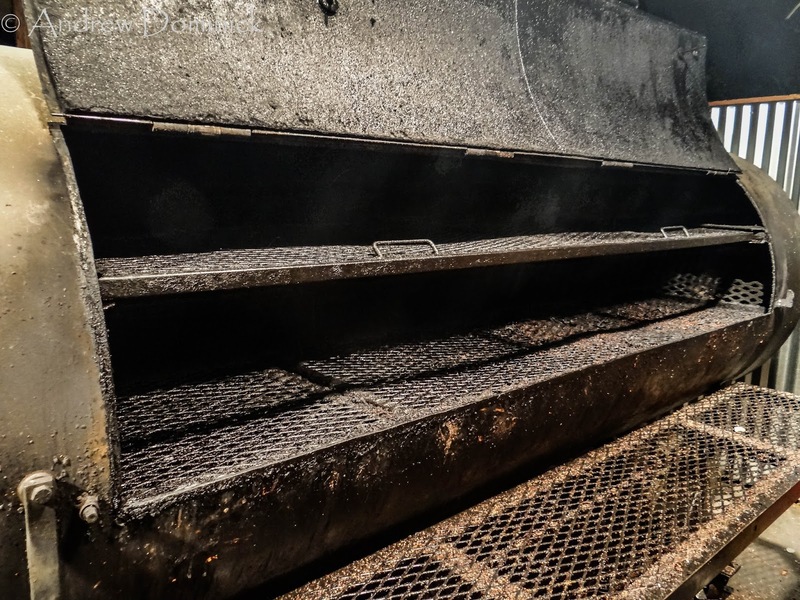 Even after the brisket is finished smoking there is still a thick, crusty exterior. I heard raves about the brisket previously to trying it and it’s all true. It falls apart with a gentle press of the fork and it’s juicy. I was told they cook their meats with the fat cap up, resulting in constant lubrication throughout the cooking process (I know it sounds sexual, it’s supposed to). The pork belly reminded me of pernil (Puerto Rican roast pork). 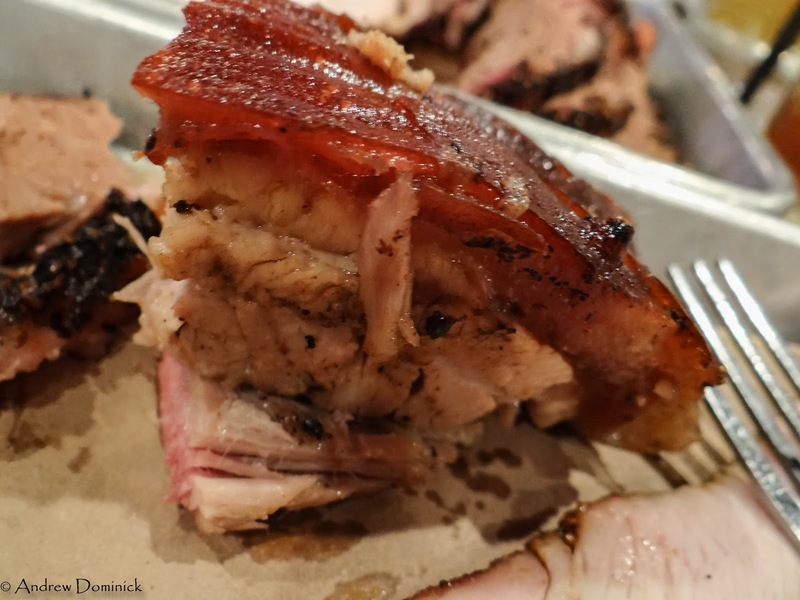 The belly flaked apart but the kicker is the crispy, chicharrón-like skin that’s achieved by finishing the pork in the oven at a high temperature. I also tried the smoked turkey, not usually my thing except on Thanksgiving, but the white meat wasn’t even a tad bit dry and it’s a healthier option for those of you who want that (they have salads too). One thing I didn’t order was both versions of homemade and smoked sausage (provolone parsley & jalapeño cheddar), and after trying both I was glad Cody sent those out. The sausages had a snap-when-you-bite-‘em casing, did not lack for seasoning, and both were juicy. The jalapeño cheddar version had a good kick to it. 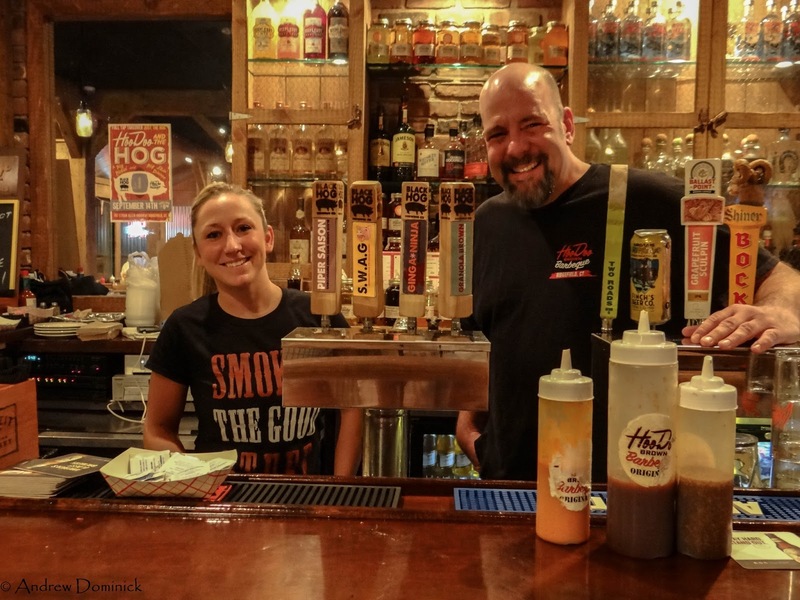 HooDoo’s menu rounds out with apps like smoked wings, BBQ nachos, poutine and fried green tomatoes; a bunch of sandwiches, and even fried chicken & red velvet waffles (I have to have that). 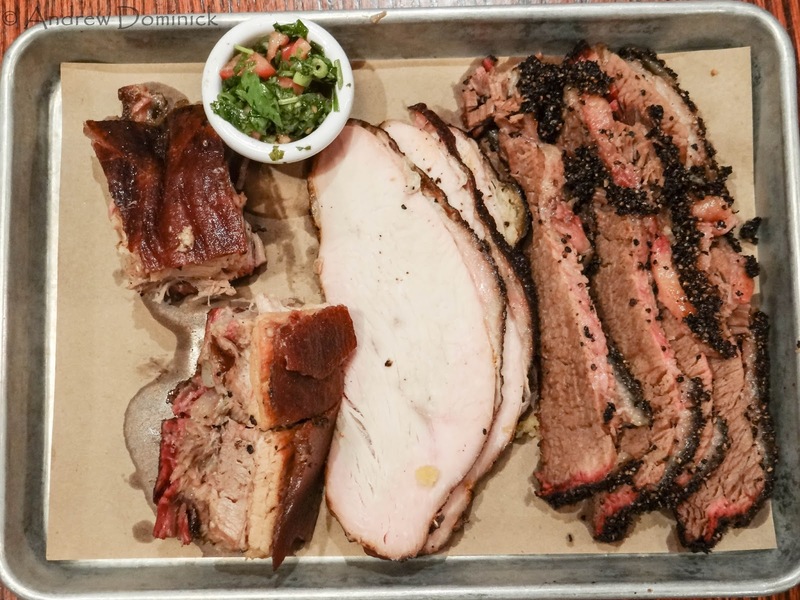 For BBQ they also offer smoked chicken, ribs, and the infamous giant beef rib that go about 1 ½ pounds each! 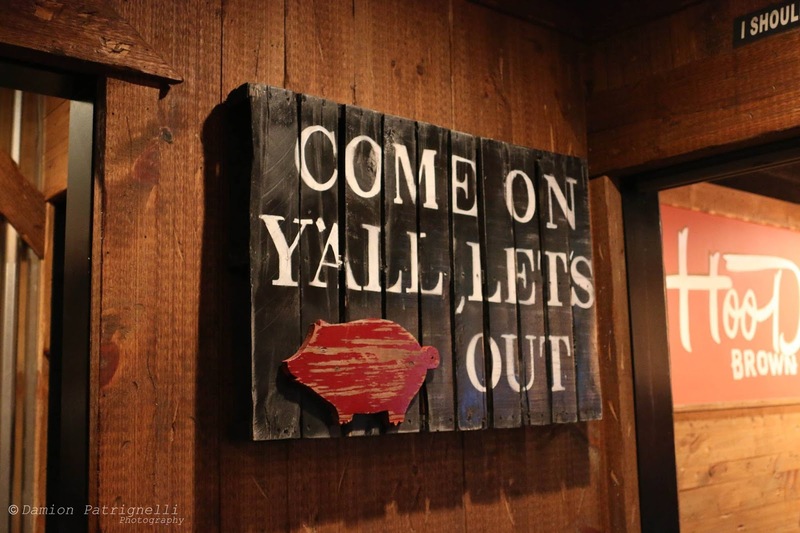 If you go with a bunch of people the Holy Texas Trinity ($65 – pound brisket, 3 sausages, rack of ribs, cornbread) or the Table Breaker ($129 – beef rib, half chicken, rack of ribs, one pound each of two other meats, cornbread) is a wise choice. For sides, they’re not forced on you, but you should get something. 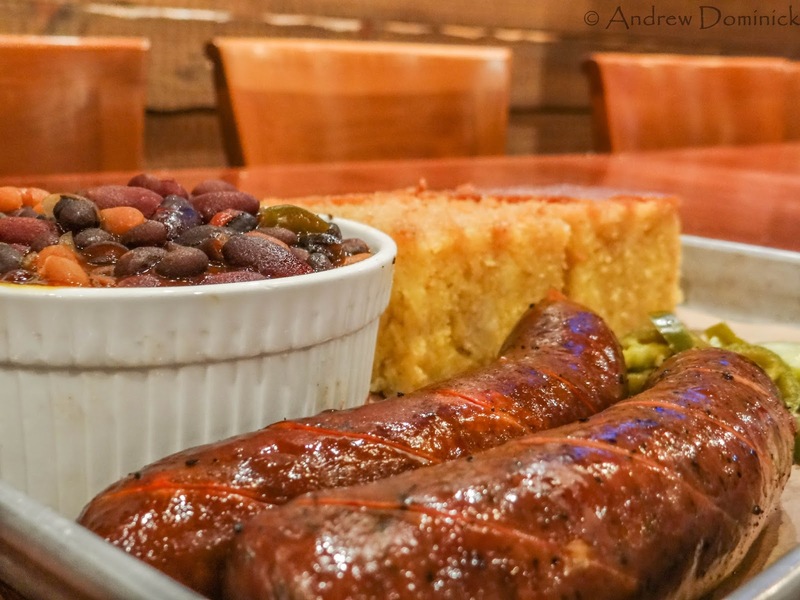 I liked the smoky and sweet pit beans, but I am curious to get around to trying more sides. Warm Toll House Pie. It is what you think it is, like a choco-chip cookie in pie form. If you’ve come this far, why not have dessert? 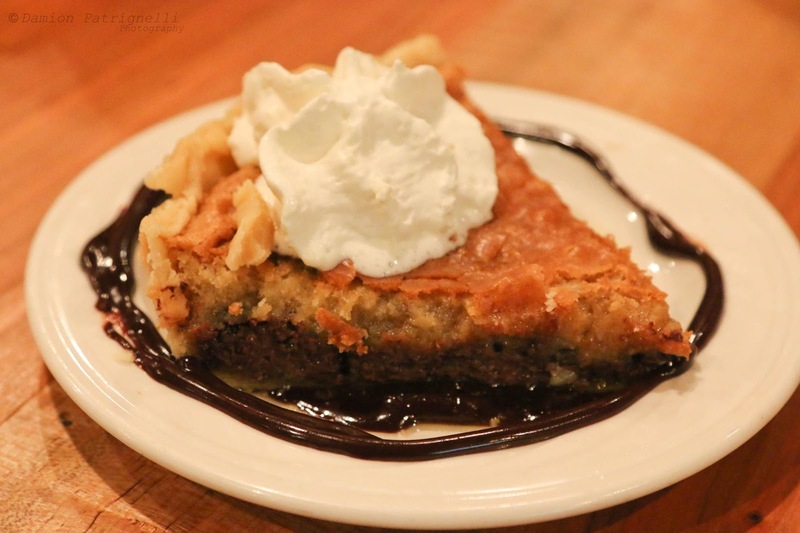 Trust me, you don’t only need something sweet after all the savory, but the desserts are all homemade…by Cody’s mom, Mary-Lou. Don’t disappoint the guy’s mom! I was thrilled that when I was there, Key Lime Pie was a special! 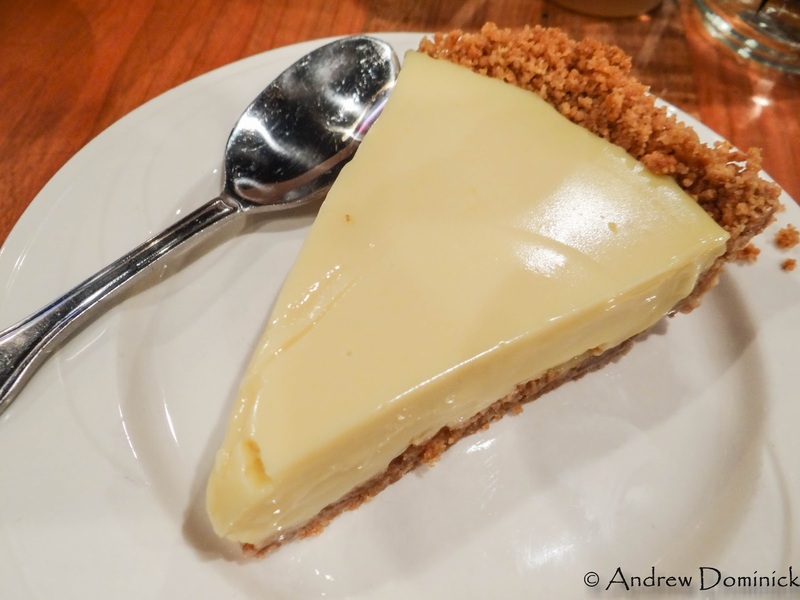 It’s my favorite pie and this was one of the better ones with its sandy, buttery Graham cracker crust and slightly tart and sweet lime curd. Remember when I mentioned that there could be a wait at HooDoo? Well, a drink is a good way to pass the time. They have plenty of good cocktail options, most of which are a good, sweet, and drinkable that make the perfect companion to counteract the salt and seasonings in BBQ. 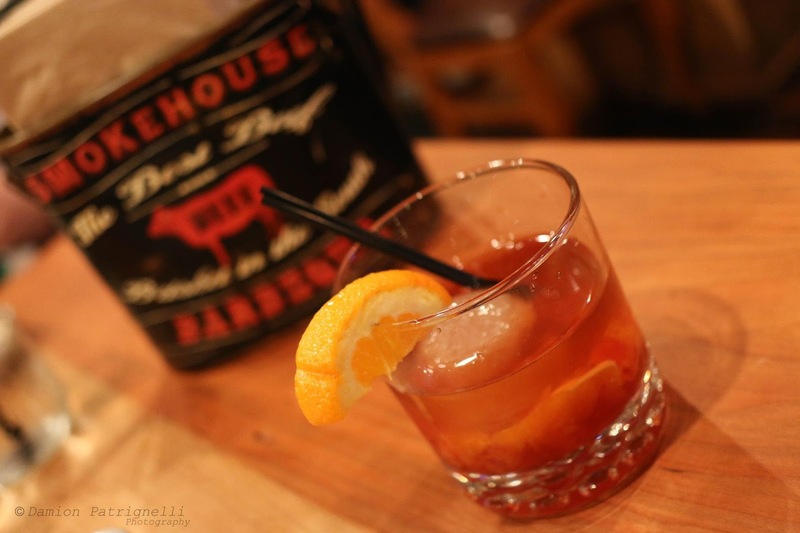 A drink on the stronger side is the Smoked Maple Old Fashioned made with bourbon and moonshine, muddled ’shine-soaked cherries and orange, and the maple syrup. 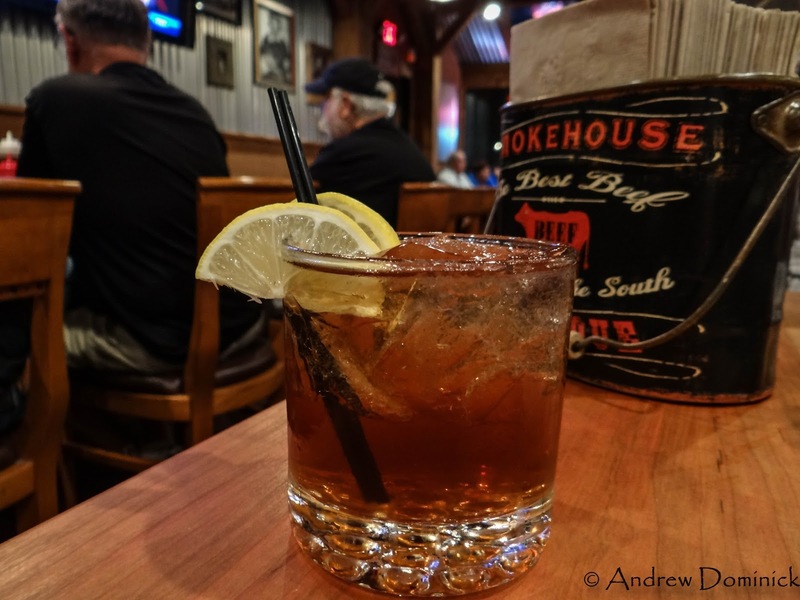 The cool part is that the ice cube is smoked (achieved by melting ice in the smoker, letting the water infuse, then refreezing it) and as it melts you can taste the smokiness. I’ve seen similar drinks on menus elsewhere but HooDoo was only the second place to get it right. The other? PDT in the East Village with its Benton’s Bacon Old Fashioned. That’s some good company to be in. HooDoo tends to have plenty of good craft beer in the house too, most of it from breweries local to Connecticut. And yeah, they have wine. HooDoo Brown BBQ is so damn good I had to resist using a plethora of curse words to further accentuate my love for this place. I see plenty of post-BBQ, coma-like naps in my future. Damion helped me eat. He found this at HooDoo and couldn’t resist a selfie.